Patricia Erickson in 1981 (from my documentary, “The Mystery of Half Moon Bay”). Patricia Erickson (PE): We do have those moments when fog can drive one crazy. We do have winter winds when although the sun is beautiful, the winds can be fierce and wet. There’s been development but not nearly what it could be. Let’s face it: you’re just a stone’s throw from over the hill each way. So in ten years time there have been some people who’ve come in but they have to be a certain kind of person who are going to stay here–or they leave. And we haven’t developed the way an area like this–easily accessible to places–would develop. A lot of people could say that’s the freeway, yes….people who want a freeway aren’t going to come here. Gene Fleet (GF): The feeling from this side of the hill to other side of the hill is so different–in that the mountains are barriers, physical barriers–it’s because there are roads to the coastside–and yet, when talking with people on the other side of the hill, on the peninsula, if I would say, ‘I’m from the coastside’, to them that would be so far away. And certainly not a place where they would live. They admire the fact that I am able to live so far away from where it’s “happening”. And for them they certainly couldn’t…They rarely drive over here…even people who come to the beaches aren’t the same folks although I notice the coastside changes on weekends. The coastside is really very accommodating. This is the ocean; it isn’t owned by anybody. This ocean is a part of the earth and it just happens this is a very special point where the ocean meets the land surface–and there’s a quality of energy when two force fields come together…. I have felt the energy of the coastside as being very strong and independent…and that the coastside coule live autonomously from the rest of what we know as civilization around here. I had an experience once when I felt this section of the coastside separating and becoming an island from Devil’s Slide to Ano Nuevo….and so we were cut off from the north and south and east. There’s the San Andreas Fault and San Gregorio Fault out at sea. This provides an isolated unit–and with the right shift we could be our own little autonomous unit out here. PE: I think the mountains know–on an energy level they know…I feel we’re so well taken care of here on the visible levl, even on a spiritual level, we are quite well taken care of. GF: I feel eccentric people are still here but they’re not the eccentric people who were here before. I feel the coastside will always be a haven for eccentric people. Maybe they’ve moved on, or just died here on the coastside, their energy is still here. Eccentric people who are here now are different and some other folks have moved on. That in a way makes it a place people come to and go through are a part of the process of being here, of being human. And for some of us, it means being on the coastside for a period of time. PE: I’m not sure all the people who leave the coast come back–but people who are tuned in on that particular energy level feel a pulling back to the coastside. There’s a certain type of person that seems to live here, and I can’t actually tell you what this kind of person is, except that they are an autonomous type of person. They can deal with being their own person and with being alone. Being alone but still having to be within community because we have to function together here on the coastside uniquely. So alone and together which is really what the dance is. You might say that we live in an oyster and just pick our pearls out…. I’m not a geologist but really feel this area is protected. I also feel I am very protected…. Patricia Erickson & Gene Fleet sitting in a Moss Beach garden. Two Coastsiders I loved interviewing for the 1981 âMystery of Half Moon Bayâ? 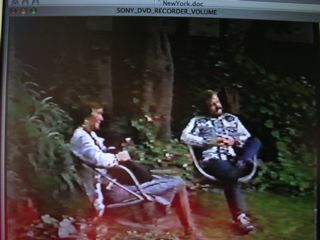 documentary were Patricia Erickson and Gene Fleet–two new age, spiritual friends who shared the belief that they lived in a unique, powerful place. Gene Fleet (GF) worked at HMB Nursery and lived at remote Tunitas Creek near the former historical site, Gordonâs Chute– and the artistic Patricia Erickson (PE) lived in Moss Beach (the house with the big rainbow painted across the garage door) near the Fitzgerald Marine Reserve. Itâs 1980 and Pat and Gene speak freely about the power Devil’s Slide and the Coastside. Patricia Erickson: I think itâs a power pointâ¦. PE: â¦people that live here, I think theyâre high energy peopleâ¦.I think people hwo live here are special people, too. I really feel thatâ¦And I think that they bring a degree of energy which stabilizes the earth, too. GFâ¦There is a basic grounded quality about people who come here. In order to be able to be here one canât be too extravagant. There is a bit of that element coming in with commuter traffic and suburban development of the Coastsideâbut there is a stronger grounding element. It is expressed through various kinds of people living hereâ¦farmers and fishermen and people who are living in the mountainsâvarious nationalities represented hereâ¦Weâre all sort of in this together. In the fog together. In the anticipation of an earthquake, I mean, itâs constantly with usâ¦. PE: I donât cope with the fog. I think fog is a very powerful energyâ¦We have a unique weather pattern which drives many people insane. We have a unique list of elementsâand force and power hereâ¦One of the elements is isolation which Gene was talking about. You just donât commute to movies every nightâ¦So people who live here are centers almost within themselves. People who can also join in the community but also seem autonomous channels of energy. There is a certain kind of person which stays here, which lives here, which thrives on it and which gets off on it and also channels into itâ¦. PE: People who need big complexes, all that development, obviously havenât stayed. Energyâs magnetic. So, energy attracts energy. So the energy thatâs here obviously is going to attract an energy. Weâre magnets to each other. I feel, too, that part of the reason venture hasnât occurred here is because thatâs not what itâs all aboutâ¦I think that first of all the earth, which is the very grounded thing here weâre living on on the etheric level is really not supportive of a freeway happening. My feeling is that the mountains themselves have a life essence form, a life energy on an etheric level which is saying âno, this is not going to happen.â? I also think that the people who live here-and I’m really going out on a limb because I know there’s a lot of people who’d like to move out fast or have a freeway but I think, basically, a great many of the people who live here, on the etheral level, support the mountain’s decision. Those are the two energies that are compatable–the people who stay which keeps bringing in that energy which the mountain, you might say, has the first and last word–because no one’s going to control that mountain.